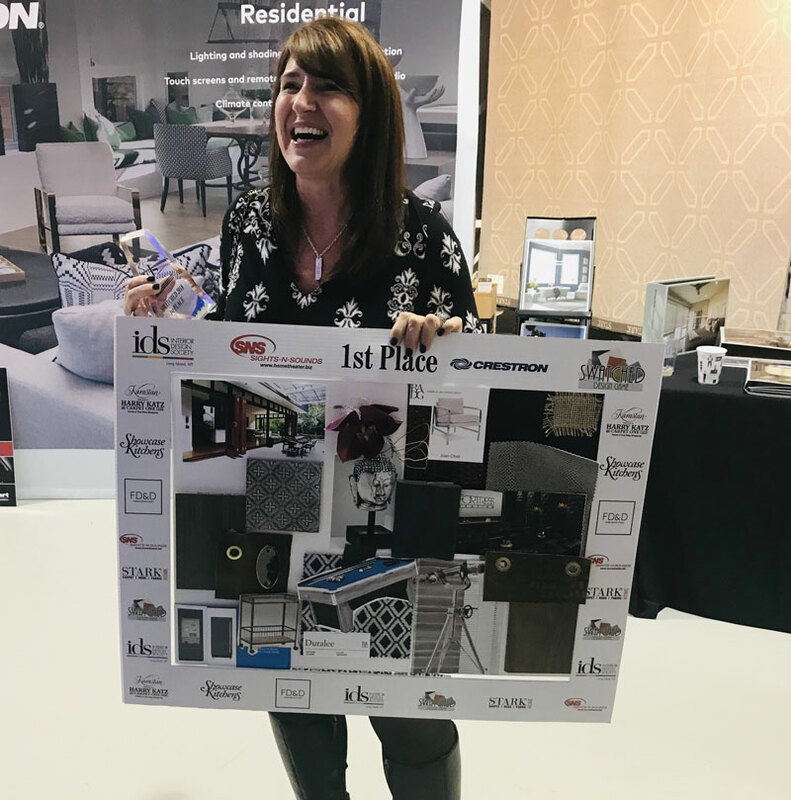 Congratulations to Jeannine Price – Grothouse Regional Sales Representative for New York, New England – and her husband for taking home first place at the Interior Design Society Long Island Chapter Swatched 2018 Event Design Competition! This was the third annual Swatched event. 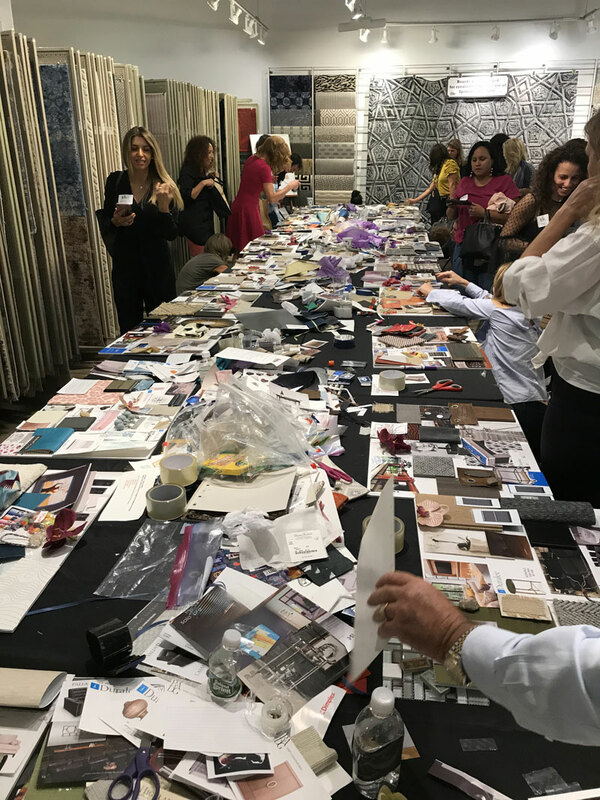 It took place at Stark Carpet in Syosset, New York on October 9, 2018. All proceeds from this event supported charities by the design judges. 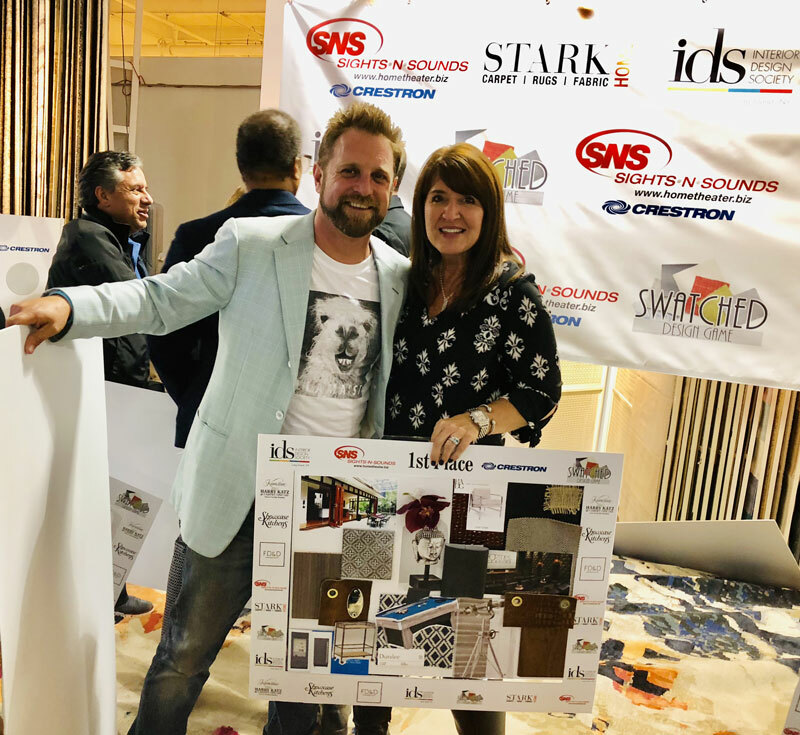 Among the sponsors, guests included kitchen and bath designers, exterior, interior, students and architects. All competition participants had one hour to put a swatch board together from a mystery bag of materials and a design library. The items in the mystery bag must be used for the design to qualify. The swatch boards included carpet, tile, paint colors, décor and more. At the end of the hour, the judges chose their favorite four boards. With over 200 attendees, and about 50 designers participating in the competition, Grothouse is proud of Jeannine for taking home first place! Click here to watch a video of the event. 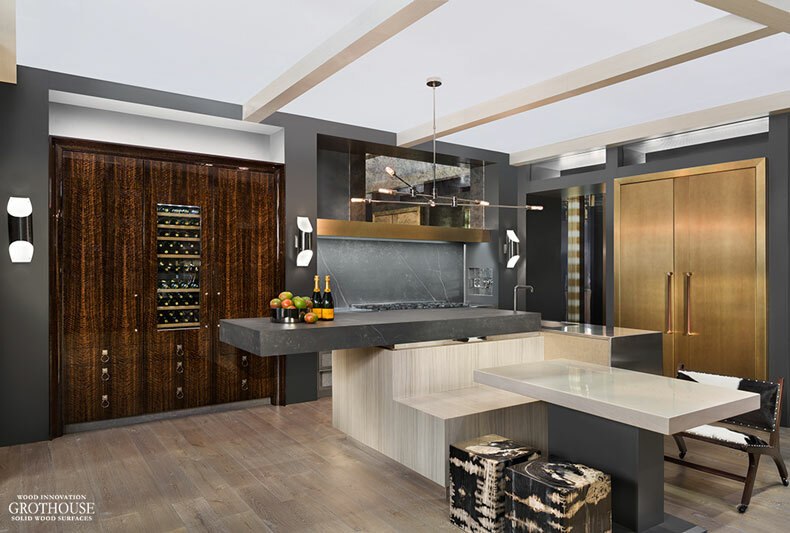 Grothouse, Inc., the leading solid wood surfaces manufacturer located in Germansville, Pennsylvania, was featured on Ryan Serhant’s new television show, Sell It Like Serhant. The episode aired Wednesday, April 25, 2018 told the story of Frank. Frank used to work in the restaurant business, but unfortunate circumstances resulted in a career change to selling kitchens and custom cabinets. After working for four months without making a sale, Frank was at the risk of losing his job if he couldn’t sell a kitchen in one week. 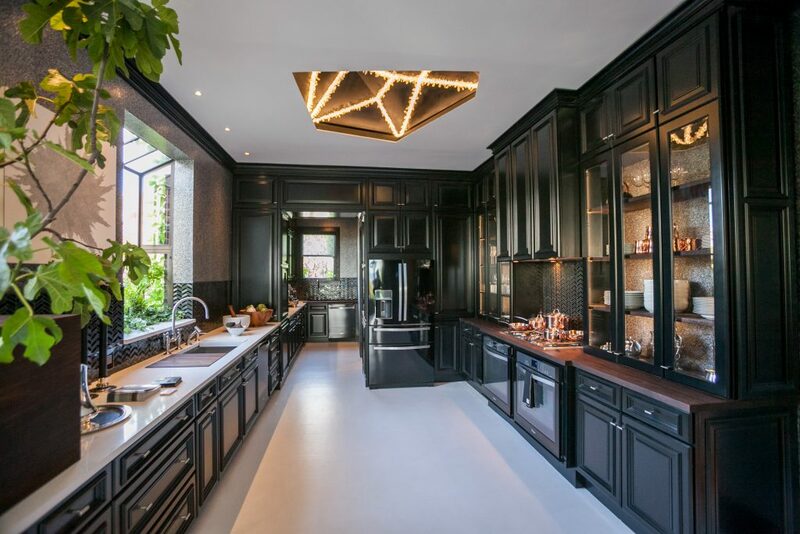 Ryan Serhant, the leader of one of the top real estate teams in the United States, came to Frank’s rescue by taking a dive into the world of kitchens and cabinetry. To help Frank reach his full potential, Ryan knew that Frank needed to learn everything there is to know about cabinets. Knowing the facts would help and so, they decided to visit Pennsylvania to learn about the wood used to craft cabinets in addition to cabinet making. Their first stop was Germansville, Pennsylvania where they met Paul and Denise Grothouse of Grothouse, Inc. Denise taught Frank all there is to know about the solid wood used to craft custom cabinets. After a skid loader ride, Paul assisted Frank and Ryan to cut down a dead ash tree from the woods located on the Grothouse farm. Denise Grothouse with Ryan Serhant and Frank. Denise Grothouse showing Ryan Serhant and Frank the different wood species used to craft cabinets. Ryan Serhant and Frank enjoy a skid loader ride from Paul Grothouse. Frank, Ryan Serhant and Paul Grothouse. Paul Grothouse, Frank and Ryan Serhant prepare to cut down the tree. 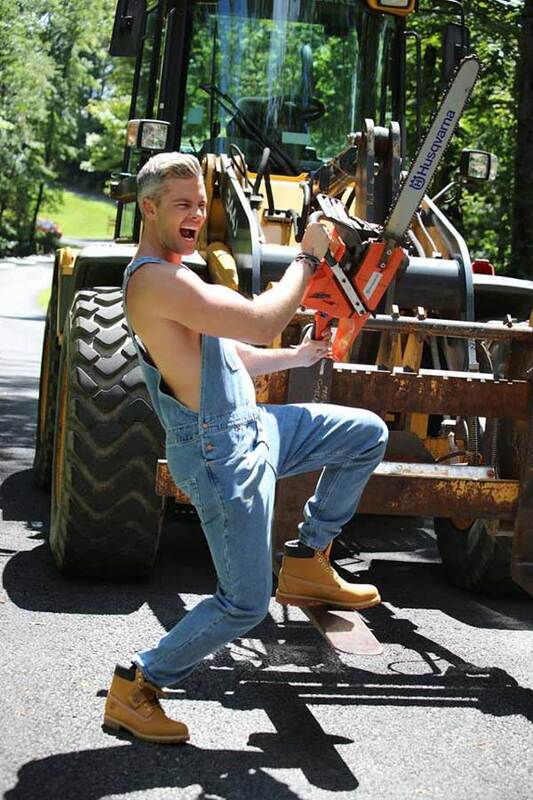 Ryan Serhant’s first experience cutting down a tree had him pretty excited. This isn’t the first time Grothouse, Inc. has been featured on national television. Grothouse has had the honor of participating in This Old House® TV Show six times, as well as participating in House Beautiful Magazine’s Kitchen of the Year for over 7 years designing kitchens with the likes of celebrity chef Tyler Florence. 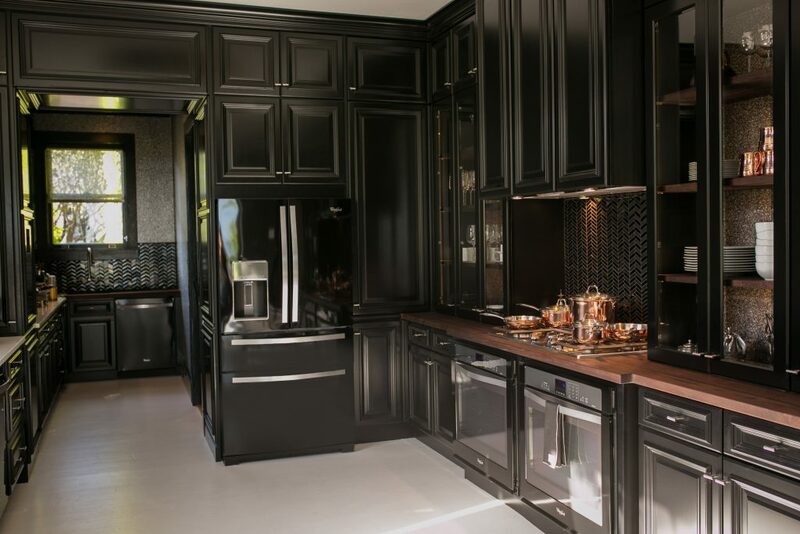 Their second stop was Kountry Kraft, a leading manufacturer of custom cabinetry since 1959 located in Newmanstown, Pennsylvania. There, Frank and Ryan met cabinet expert Elvin Hurst, Jr., Co-owner and President of Kountry Kraft. Grothouse is honored to have been a part of this new series. Visit BravoTV.com to watch the full episode of Sell It Like Serhant! 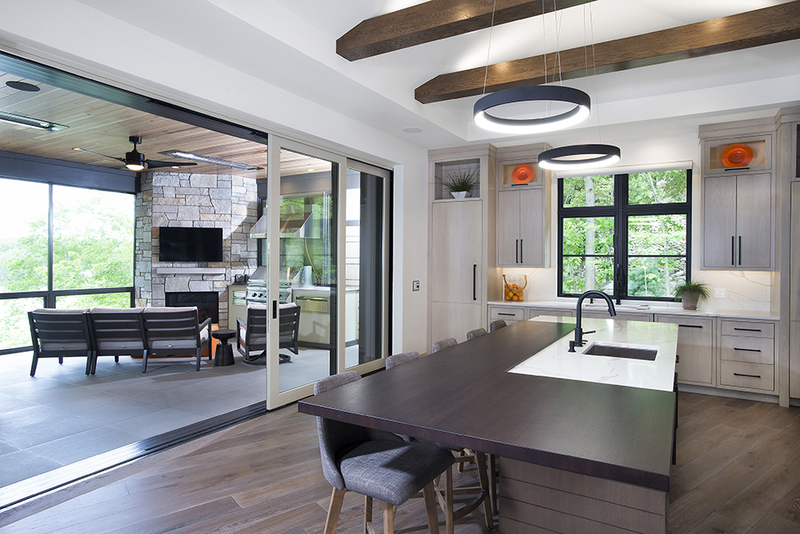 A modern prairie-style home in Grand Rapids, Michigan won a Gold Award for custom kitchen design at the NAHB Best in American Living awards. 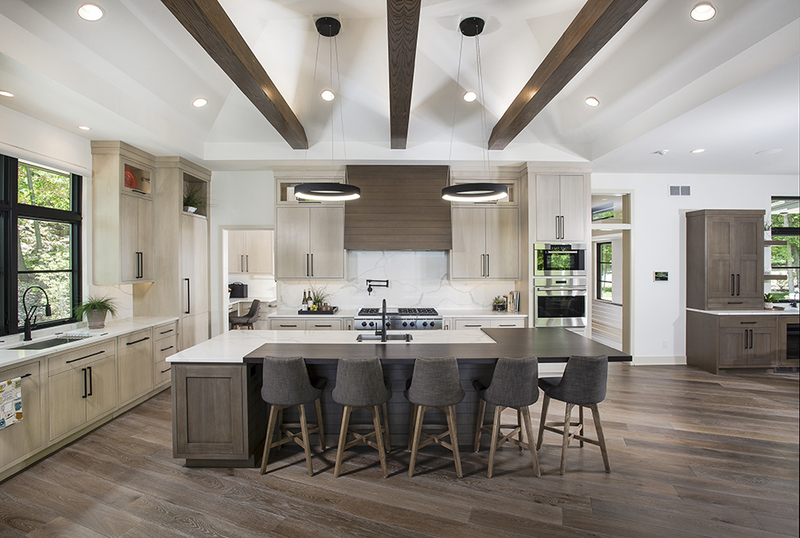 In addition to this gold award-winning kitchen design, the home was the headliner of the 2017 Spring Parade of Homes. The $1M-plus house is the result of a beautiful collaboration between Architect/Designer, 42 North – Architecture + Design, Builder BDR Executive Custom Homes, Inc., Interior Designer Christine DiMaria, Interior Merchandiser Tru Kitchens and Landscape Architect/Designer Twin Lakes Nursery. The clients wanted the design of their home to emphasize its forest-framed views of the river. Understated earth tones, light colors, Fon du Lac stone and wood accents also play off the home’s surroundings creating a home that truly embodies modern indoor-outdoor living. 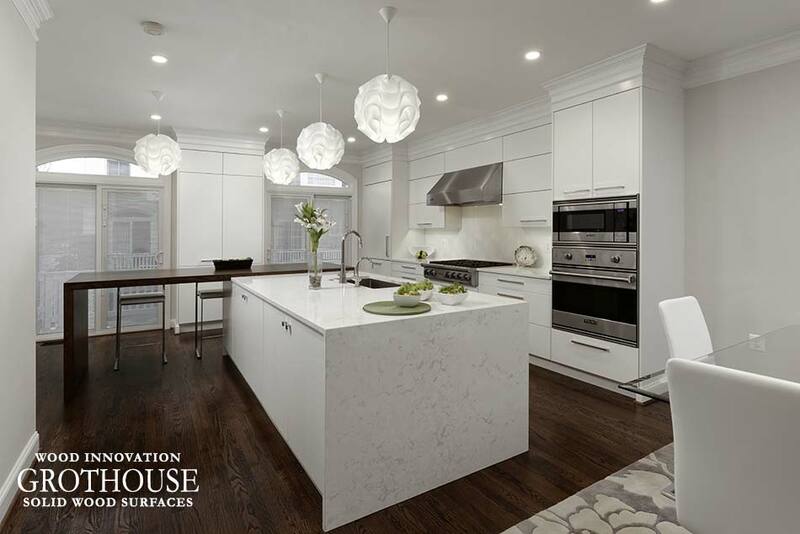 A custom Stained White Oak wood countertop was crafted for the kitchen island to accompany a quartz counter. The countertop was crafted 1-3/4 inches thick in Edge Grain construction style. 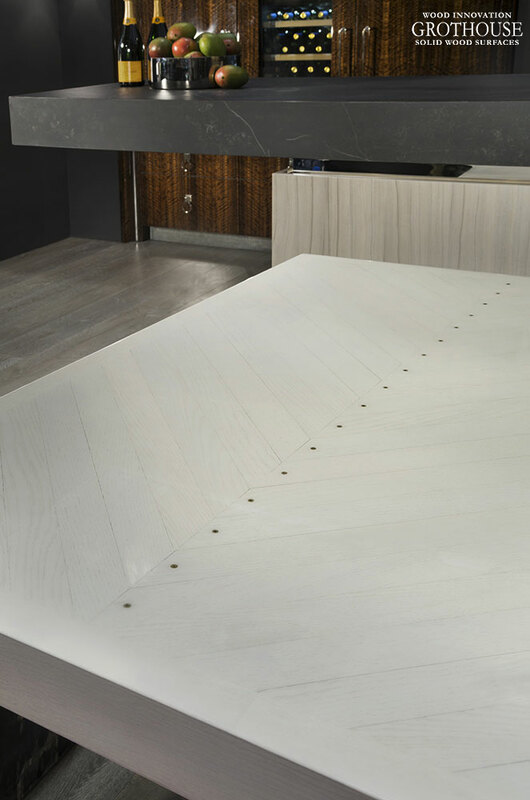 Skillfully crafted so all the grain runs in the same direction, this countertop is finished with Durata® Waterproof Permanent Finish in Matte sheen. 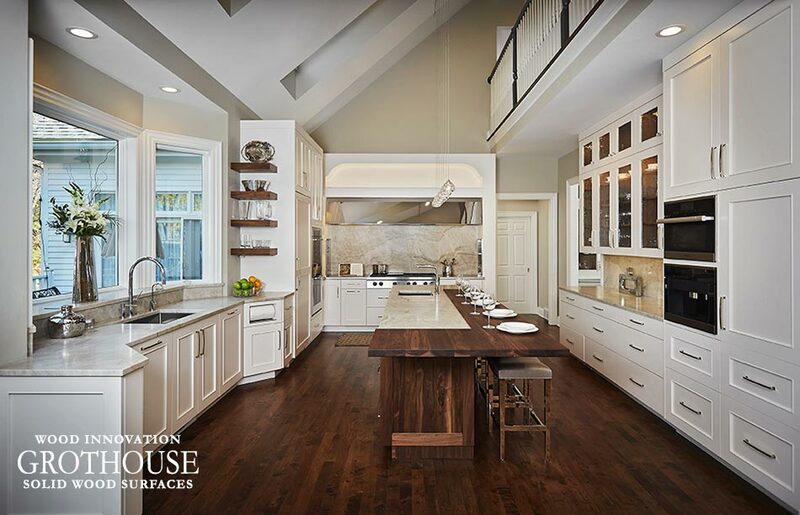 Visit the Grothouse Image Library to see more award-winning kitchen designs featuring custom wood countertops. Gray kitchen walls are gaining popularity in 2018 designs, according to the results of Houzz’s 2018 U.S. Kitchen Trends Study. 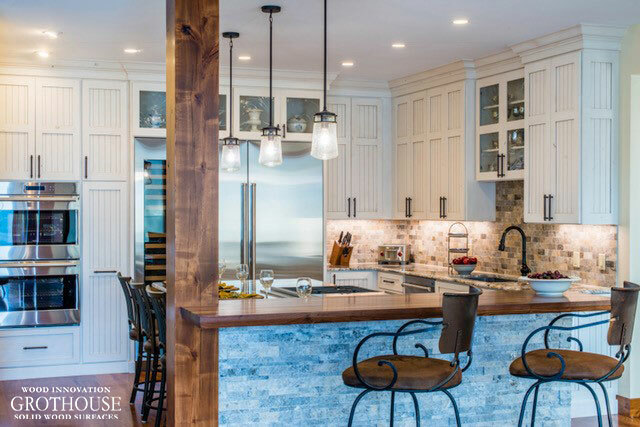 Each year, Houzz surveys American homeowners that have either completed a kitchen project, were working on a kitchen project, or planned to start a kitchen project in the next three months. The responses from over 1,700 homeowners provided insight into what is trending in kitchens this year. 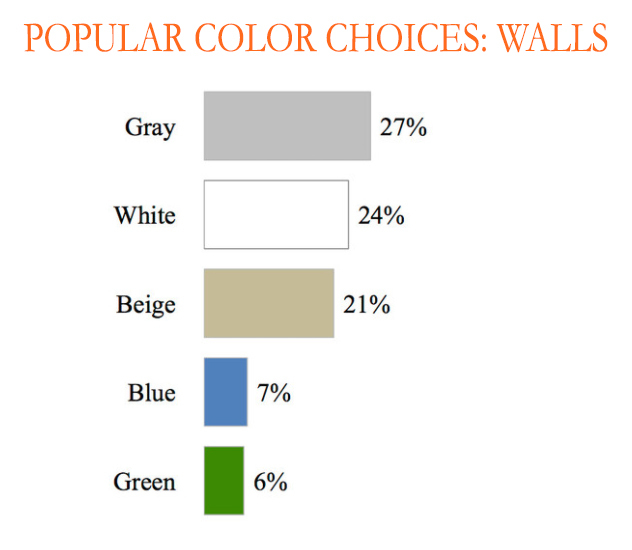 27 percent of homeowners chose gray for the color of the walls in their renovated kitchens, making it the most popular wall color. Other neutrals topped the list with white at 24 percent and beige at 21 percent. 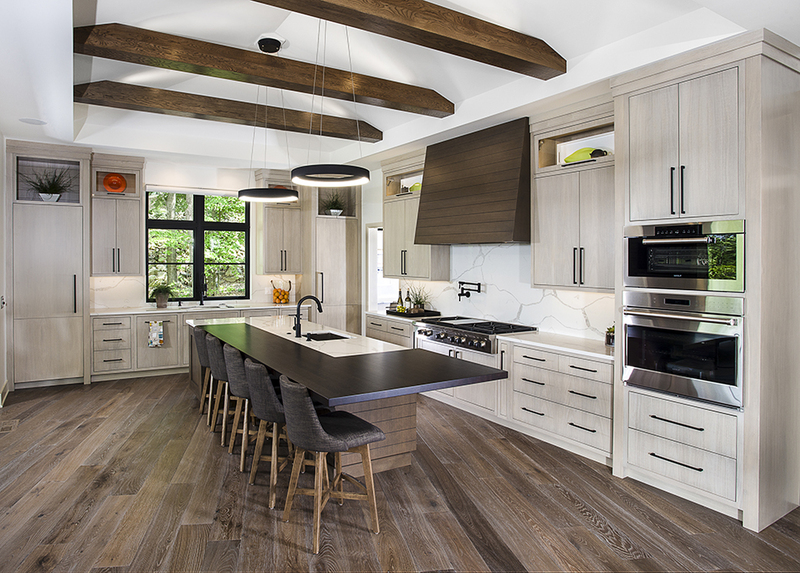 The cool tones in variations of grays are complemented by warm tones in wood countertops, which is why the industry’s best designers always incorporate wood into gray kitchens. This transitional kitchen designed by Stonington Cabinetry & Designs features gray walls, white cabinetry and a Walnut wood kitchen island countertop. The wood countertop ties in the wood flooring and brings warmth to the space. 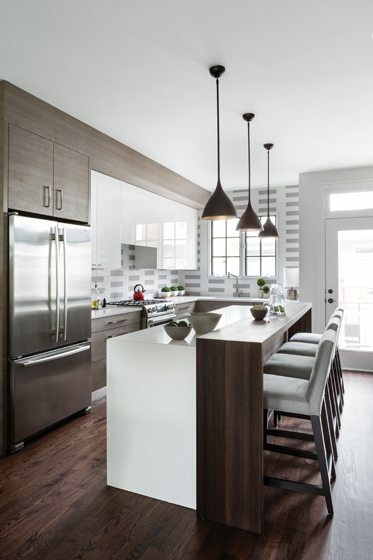 A Rift White Oak wood half parsons table was designed by Paul Bentham of Jennifer Gilmer Kitchen & Bath for this contemporary kitchen with light gray walls. 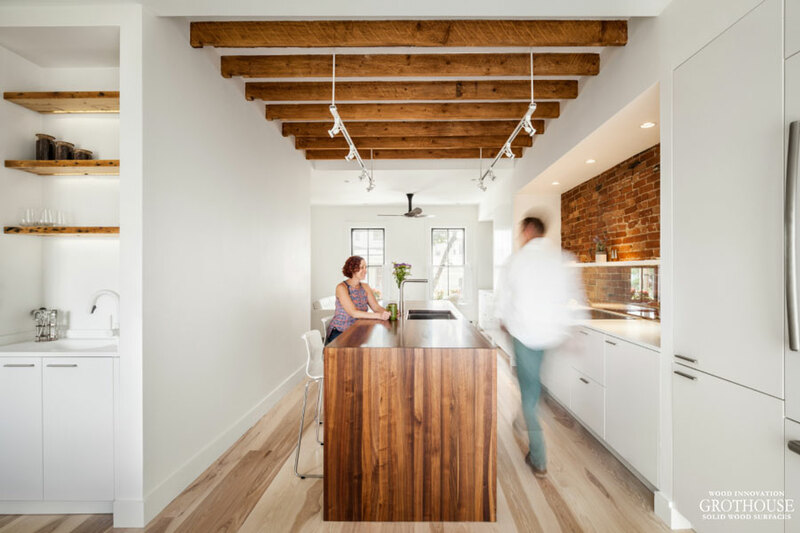 The wood table ties in the wood floor, just like in the previously pictured kitchen, adding warmth to this otherwise monotone space. 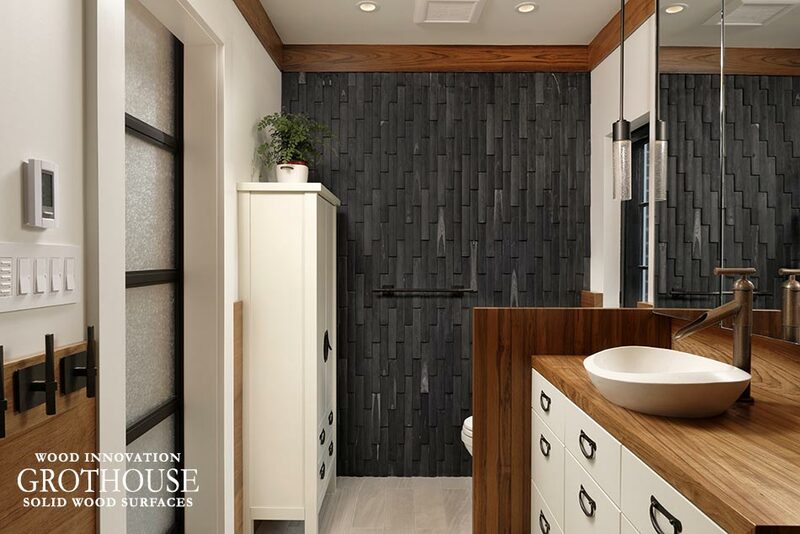 Check out the Grothouse Image Library to see more designs with gray kitchen walls. 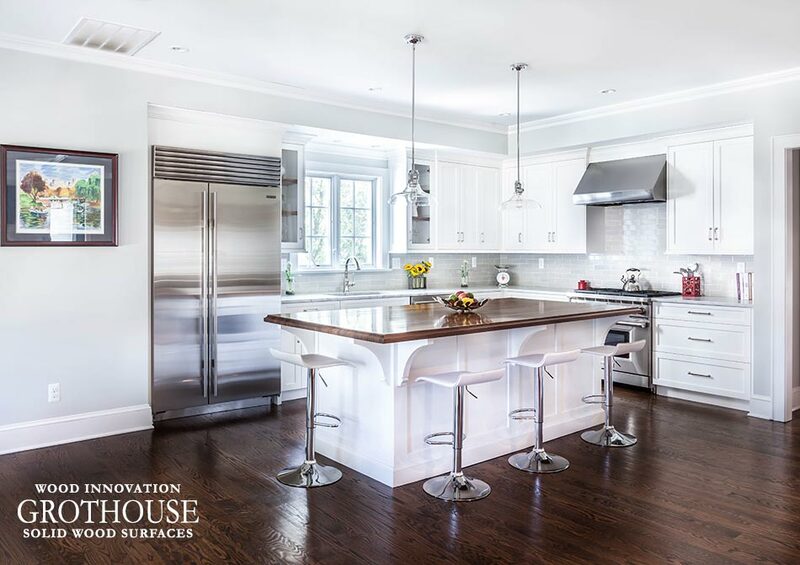 Be sure to like @grothouseinc on Instagram for daily kitchen design inspiration! This booth unveiled the groundbreaking Liebherr Monolith – a refrigerator built for the future with whisper quiet operation and advanced technology. 84 inches from top to bottom, this impressive monumental wonder of German engineering takes food preservation to a new level. With superior food-saving advancements and energy efficiency, Monolith is a fusion of technical genius and practical ingenuity. The three inch thick table top was crafted out of White Oak. It features a chevron pattern and inset brass screws down the center of the table top. A custom stain was used to achieve the white color. An eighth inch Roundover was selected for the top, bottom and vertical edges of the table top for a sleek look. The table base and base foot are coated in Anvil™ Ferrum metal finish with a Durata® Satin top coat. The Ferrum finish replicates the gray color of iron, matching the grays used throughout the rest of the design. The edges of the base were rounded a quarter inch to continue the sleek look of the table top. 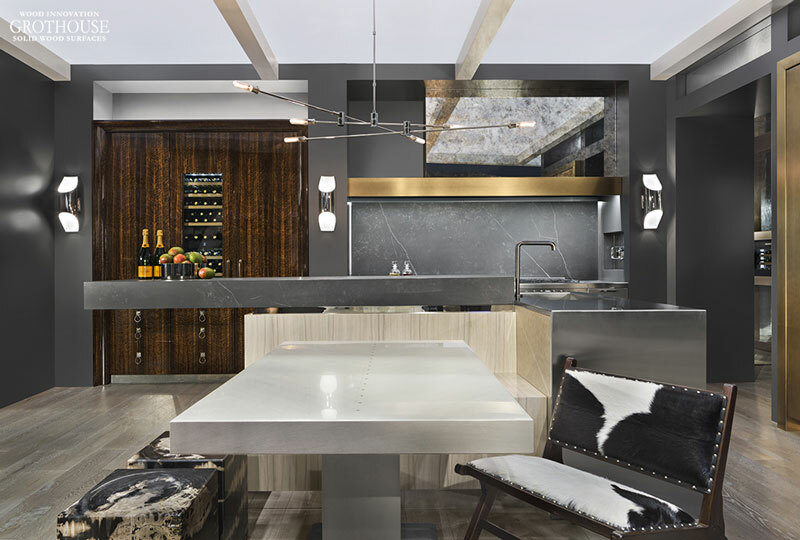 Grothouse is honored to have crafted a table for the unveiling of this stunning Monolith inception kitchen. To see more custom tables by Grothouse, visit the Countertop Image Library on our website. Am I Going to be Affected by the Chinese Birch Plywood Tariff? Russell Plywood, Inc. keeps us up to date on the progress of the U.S. Commerce Department and International Trade Commission (ITC) Tariff against Imported Chinese Birch plywood. Most recently, on November 14, 2017 there was a temporary ruling of 206% levied on those products with a final ruling date of December 1, 2017. A tariff is defined as a tax or duty to be paid on a particular class of imports or exports. What the Chinese Birch plywood tariff means is that all Chinese Birch moving forward will have a 206% tariff on it. Russell Plywood, Inc. estimates has Chinese Birch imports at approximately 7500 trucks per month. With the current capacity of our industry, 1000 trucks would be hard to get through production and will extend lead times out and force prices upward. This tariff puts Chinese Birch pricing approximately 25-30% higher than D-3 Maple. Suppliers have stated that once their current stock is depleted, this item will no longer be available. At this time, there is no way for domestic mills to sell any of their products below Chinese pricing. 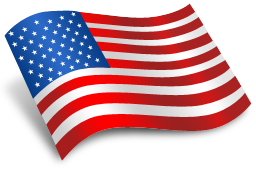 This tariff will impact the cost of cabinetry made in the United States that historically use Chinese Birch Plywood. We strongly encourage cabinet manufacturers inform and prepare their dealers and designers for the quick upward price movements and lead time extensions. Check back for further updates about the Chinese Birch Plywood Tariff. 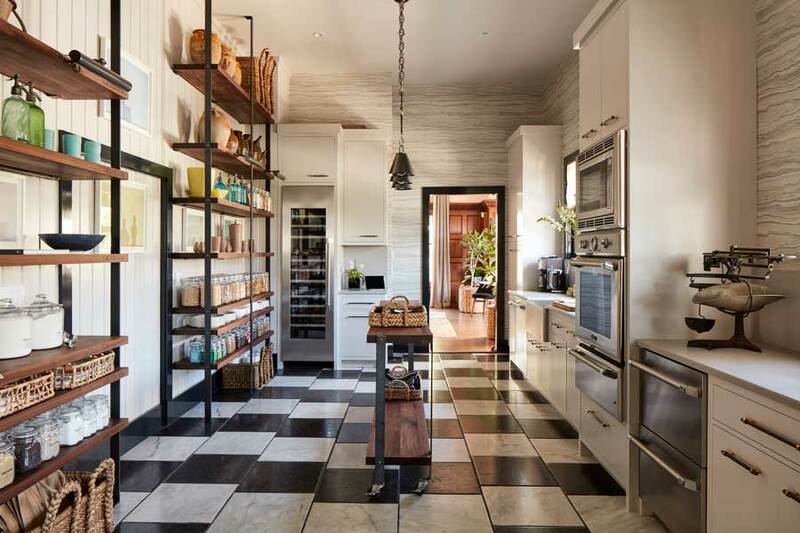 Wood shelving is a major design trend seen in spaces of all styles. Wood shelving can be designed for creative storage solutions out of necessity or decorative desire. 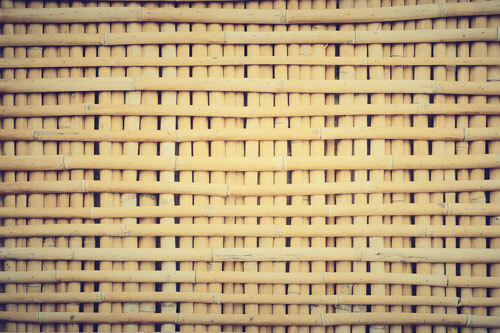 Part of the reason for this trend is because wood is an excellent shelving surface due to its natural kindness to fine china and crystal. When finished with Grothouse Original Oil™, wood shelves can be sanded and re-oiled to look like new after years of use. Wood shelves are often designed for use as open shelving because their open nature makes a space feel larger. 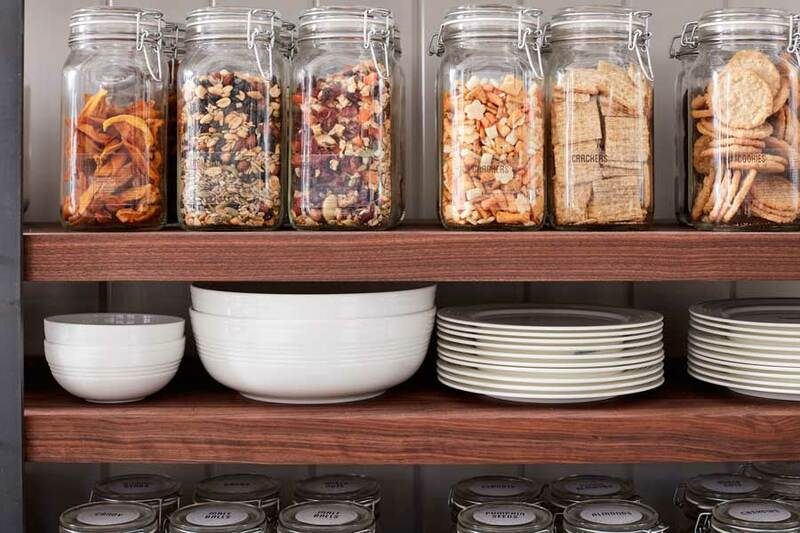 Open wood shelves are a great substitution for traditional closed cabinets. 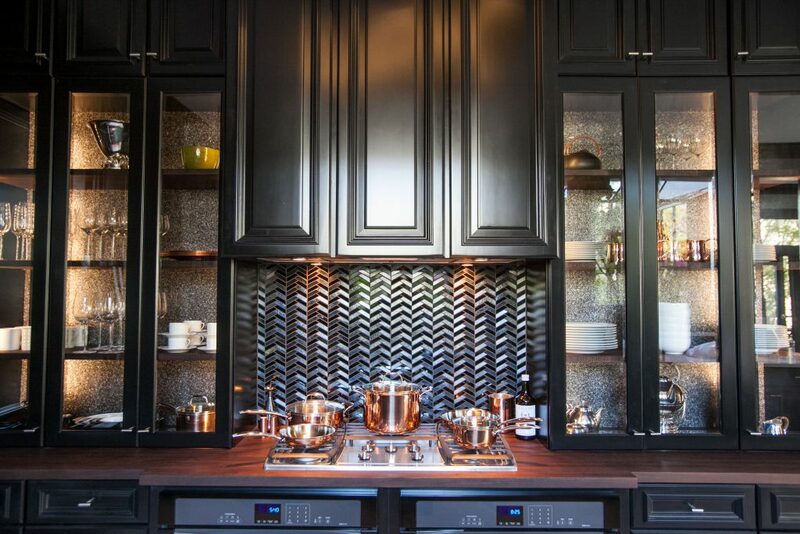 Another popular design option is to use wood shelves for cabinets with glass doors. The shelves act as a beautiful backdrop to display dishes and other items. Jon de la Cruz was perfectly on trend with his design for House Beautiful Kitchen of the Year 2017. 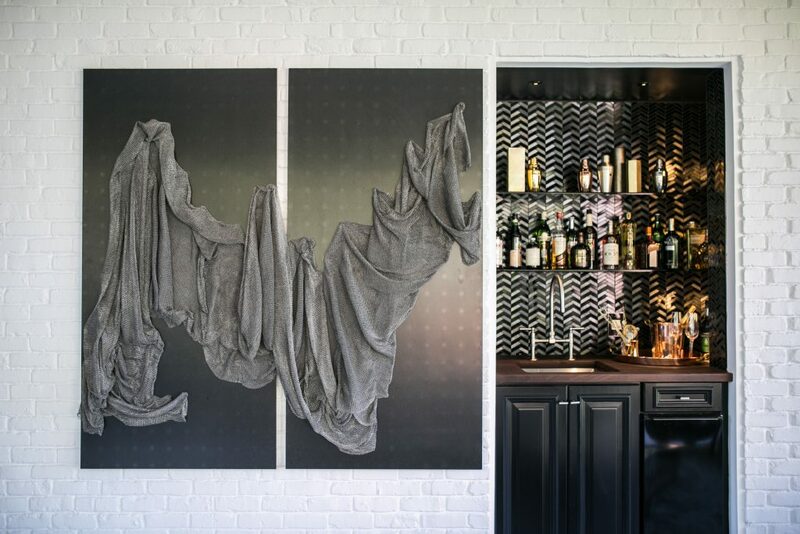 Custom black walnut wood shelves grace the 12-foot high walls. Exposed brackets anchor each wood shelf. Capturing the ethos of pared-down, timeless elegance, the shelves serve as a dramatic accent for custom pantry organization by Blisshaus. 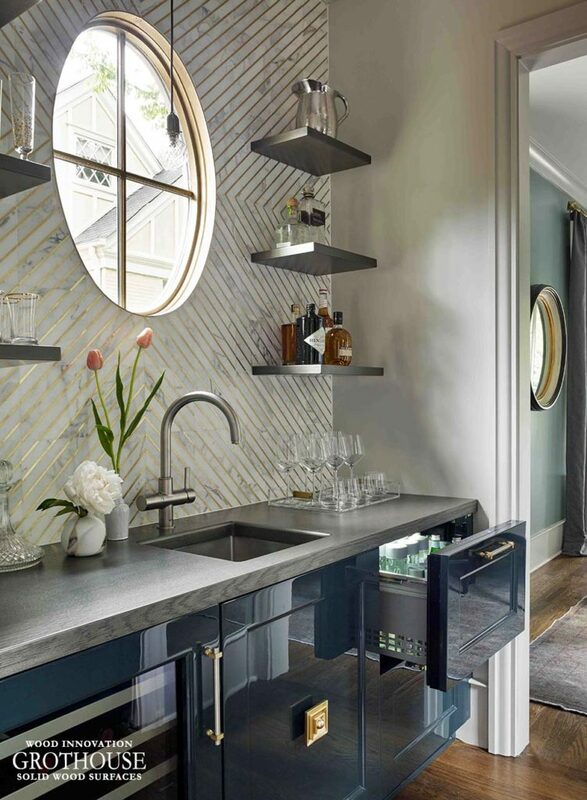 Custom White Oak wood floating shelves gilded in Anvil™ Argentum metal finish were designed by Matthew Quinn for House Beautiful Kitchen of the Year 2016. The shelves were designed to match the bar top. With 8 Anvil™ metal finish colors available, shelves can be custom crafted and gilded to match the design and style of any space. Anvil™ finishes can be applied to any wood specie or a composite substrate. Click here to learn more about Anvil™ metal finishes. 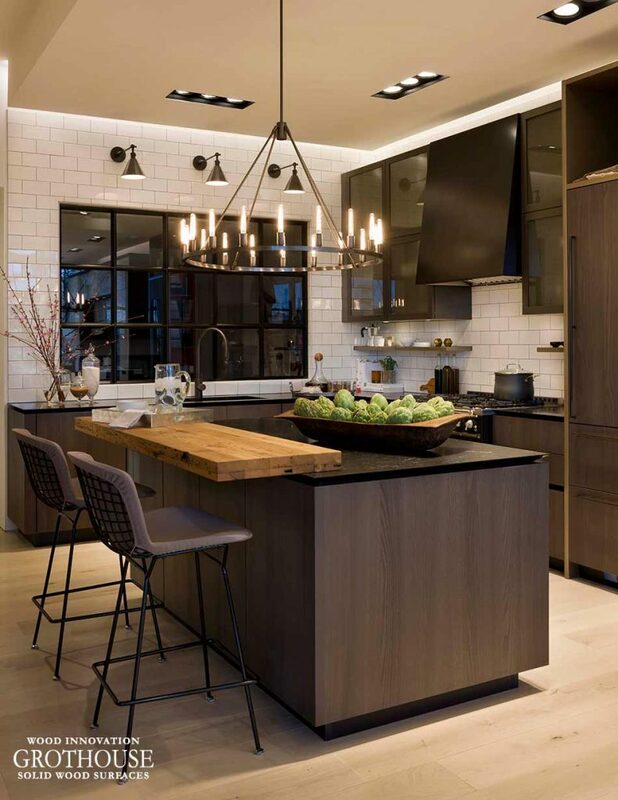 For House Beautiful Kitchen of the Year 2014, Steven Miller designed custom Peruvian Walnut wood shelves to showcase bowls and other dishes in black cabinets with glass doors. The shelves were customized for organization perfection, with laser engraved labels on the front for bowls, drinking, dessert and more. 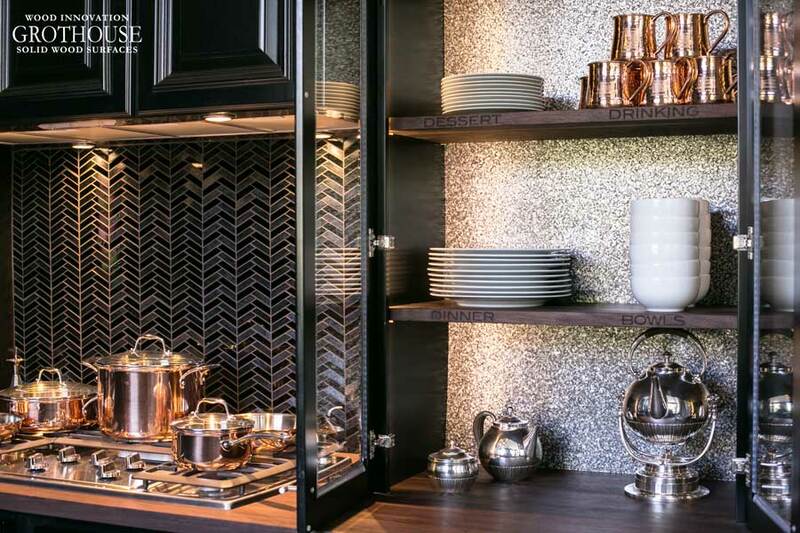 Custom crafted to match the Peruvian walnut countertop, the shelves pop against the silver sparkling backsplash. 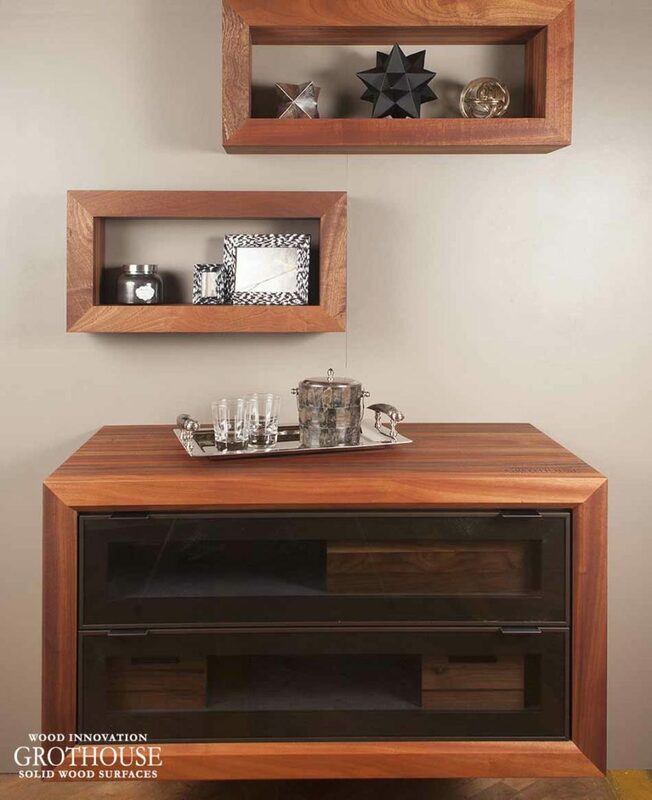 Another form of wood shelves is in the form of shadow boxes. Lisa Martin of Signature Custom Cabinetry designed two Sapele mahogany wood shadow boxes to complement the cabinet surround in this display. The shadow boxes make for some unique looking shelves with plenty of space to showcase decorative items. 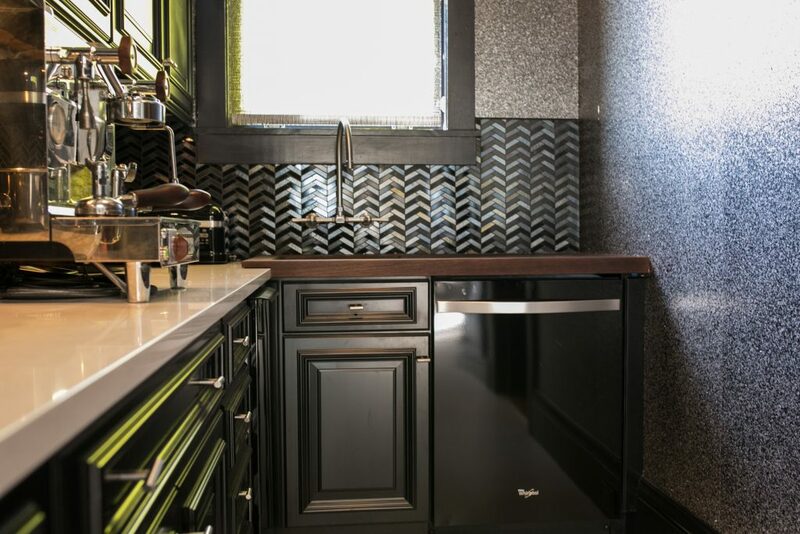 Learn more about the specifications of each design featured in this blog by visiting the Countertop Image Library. Want to see more designs with custom wood shelving? Follow @grothouseinc on Instagram and like Grothouse on Facebook!